Wrapped platform and stiletto heel. Color: Teal. Rubber sole. MICHAEL KORS Charm Sling Platform Wedge Heels Black Size 7. Condition is New with box, never worn, floor model. They were purchased from Macy’s Shipped with box, USPS Priority Mail. Please feel free to ask questions. 4.5" PLATFORM SANDAL, STACKED HEELS. MATERIAL: PATENT LEATHER. BUCKLE CLOSURE. COLOR: NAVY BLUE. GOLD TONE HARDWARE. ROUND, OPEN TOE, PADDED FOOT-BED. Actual color may vary slightly due to lighting. WHEN YOU RECEIVE IT. New never worn shoes. Classic black n white. This item has not been cleaned. The condition is always listed. Item(s) are sold as described/as is. It's not nice!it's a mad Mad MAD WORLD! 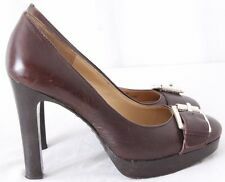 Women Shoes Michael Kors Size 9 M Leather Brown Ankle Strap Platform High Heels. Condition is Pre-owned, worn just once. Shipped with USPS Priority Mail. Platform - 1.5”. Heel, with platform - 4”. This is a beautiful pair of Michael Kors high heel platform style shoes It is a leather upper in a suede material and rubber outsoles. Shoes are in excellent condition. They have been worn very minimal. I love them but the heels are a bit too high for me. I’m hoping to find someone else who will enjoy them. Size 9.5 medium width. Leather shows no scuffing or stains and looks wonderful. The bottoms show minor use. In great condition. Has close to a five inch heel. Gorgeous MK pair; ready for dancing. Though preorder in good shape. Very comfortable despite length of the heels. Ankle strap with polished buckle closure. Chunky, stacked heel and platform. Synthetic sole. Leather: Cowhide. Platform: 1.25in / 30mm. Heel: 4in / 100mm. michael kors shoes Black 7.5 Platform Heels With Gold Buckle. Condition is Pre-owned. Shipped with USPS Priority Mail. A few scuffs as seen in pictures on outside of shoe. Suede in good condition and lots of use left in these. A chunky, tall heel and platform intensify the retro-chic style sandal topped with a slender ankle strap. Closed Toe Ankle Strap, Black Suede. Adjustable strap with buckle closure. 5" heel; 1 1/2" platform. Michael Kors Black Peggy Wedge Sandal. They have a gold buckle and the upper is leather. Size 7 1/2 M Platform Shoe. Condition is Pre-owned. Shipped with USPS Priority Mail. The total heel height is 5", with 1" platform. Cushioned footbed. Very tiny undetectable scuff, and minor streaks on the wood-look platform of the left shoe. May have not been worn. Very good condition. Floor model that is brand new and authentic. Size 9. See picture of details and minor wear. The soles are mint. Comes with a Michael Kors box but it’s not the original. Ankle Strap. Platform: 0.75”. Leather Upper. Leather Outsole. GREAT CONDITION! Good pre-owned condition. Please reference pictures as a further description and to verify the condition. Condition is Pre-owned. Style; Wedge heels sandals. Covered heels. Pointed toe. Shoes show the following: Right: shows right at the front toe a small stain of glue and a small material rub. Left: Right at the front toe area show a material rub CHECK PHOTO #3 FOR THESE DETAILS. Michael Kors Abbott Leather Espadrille Black Sandal Women's sizes 5-11/NEW!!! New! MICHAEL KORS London platform peep-toe high heel sandals. Women's size US 10M / EU 41M Color : Dark denim blue Shipped with USPS Priority Mail. NEW without box and small gap imperfection on both front wedges. Only noticeable upon careful examination. Please see photos for details. Two toned. Black patent leather peep toe with a contrasting white foam 4 3/4 wedge. Buckled ankle strap. Retail $150.00 Same shoe selling for $75 used online. VERY NICE. NEW IN BOX. 'Ariel' Platform Sandal, Size 9.5 M - Brown. Platform at heel 3.5". Leather upper. Platform: 1 1/2". Heel: 5 1/2".